We had 3 winners for our 2016 Mother’s Day Car Giveaway on May 8th. 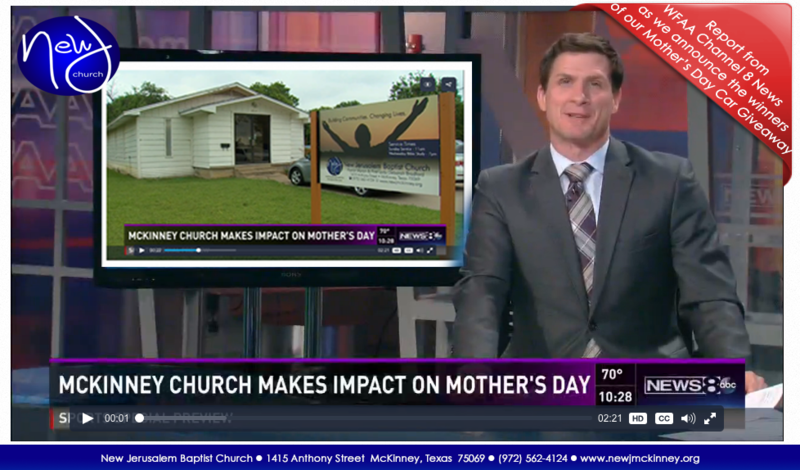 Dallas-Fort Worth ABC News affiliate WFAA Channel 8 News featured our giveaway in a news broadcast. Thank you to WFAA Channel 8, 97.9 Beat and the countless others who provided support for our car giveaway. REMINDER – If you would like to be contacted about future New J events, please contact us. 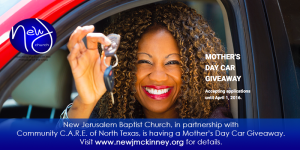 New Jerusalem accepts donations on an on-going basis for Car Giveaways to help single mothers. We also accept all vehicular (cars, vans, trucks, boats, etc.) donations. Send us your contact information about your vehicle and we will contact you to make arrangements.